Arlene Hunt’s dark and atmospheric stories perfectly capture the grimy underworld of Dublin and beyond. She is the author of a series of fast-paced crime-thrillers, featuring John Kenny and Sarah Quigley from Quik Investigations. Her sixth novel Undertow was nominated for best crime novel of the year in 2009. Her current novel – a stand alone set in the US – entitled The Chosen, was voted as TV3’s Book of the Month for November 2011. As part of the 5th Dublin Book Festival I headed to Smock Alley Theatre, along with fellow writing.ie Crime Scene Book Reviewer, Mick Halpin, to be inspired! Inspiring Crime Writers was chaired by Louise Phillips, author of Red Ribbons, and her guests on the night were Niamh O’Connor and Conor Brady. Niamh is the author of three crime novels; her latest, Too Close for Comfort. She is also the true crime editor for the Sunday World. Conor published his debut crime novel, A June of Ordinary Murders, earlier this year. He was formerly editor of The Irish Times. What a privilege – to be asked to chair Three Voices/Three Forms and showcase three such diverse and talented writers! There could be only one answer – a resounding YES – when I was asked to chair Three Voices/Three Forms at the Loose End Studio, Civic Theatre last Wednesday. Each writer read extracts from their work – Colm from his poetry, Don’t Go There; Eileen from her short story collection, Snow Shoes and Louise from her crime bestseller, Red Ribbons, along with a tantalizing taster from The Dolls House. After their Readings I had an opportunity to ask each writer a couple of questions about their writing before opening up to the floor where the fun really began. 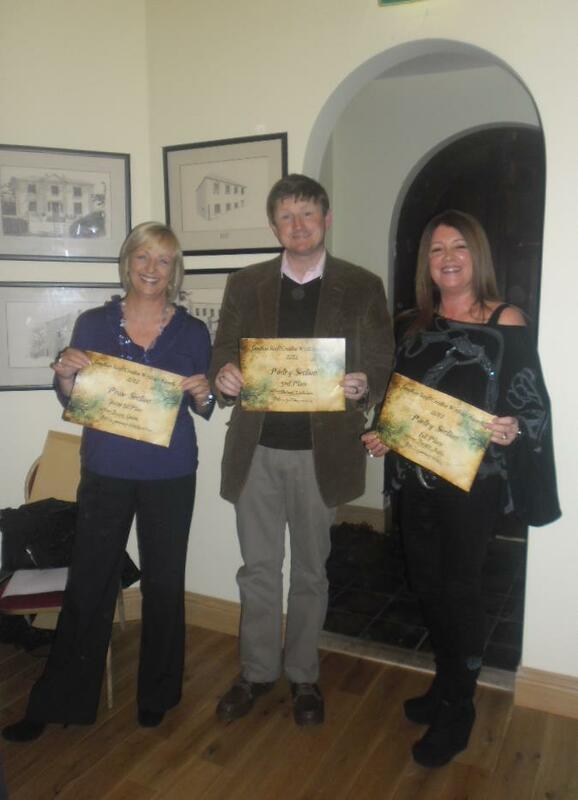 You only had to look at the audience to see how much they enjoyed listening to these wonderful writers and from the photo’s it certainly appears as if Colm, Eileen and Louise enjoyed the night too! New work by emerging writers based in and around RUA RED will be read and performed by actors from South Dublin theatre and film groups in a collaborative and inter-generational showcase event led by writer Sue Hassett and actor Rachael Dowling. From 7pm to 8pm, before the Three Voices/Three Forms event, ticket holders are offered 15% discount in the RUA RED café. 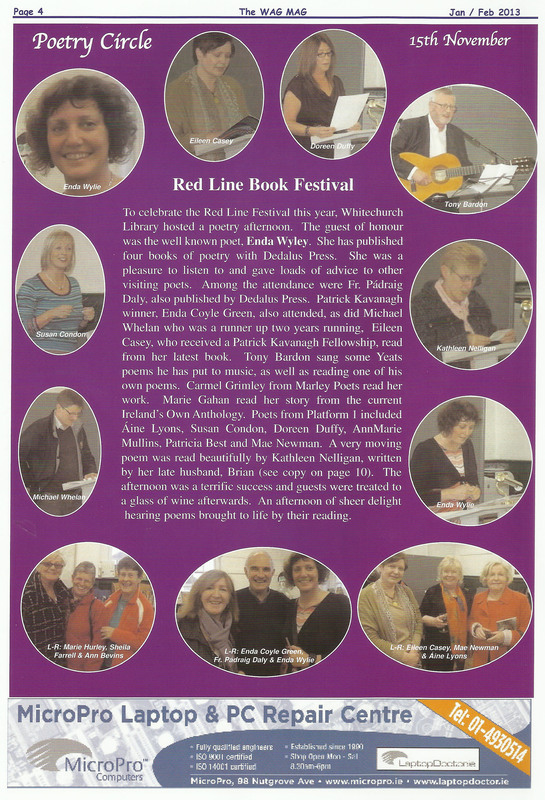 In celebration of the Red Line Festival, Whitechurch Library hosted a poetry afternoon on 15 November. The guest of honour was the well known poet, Enda Wyley. 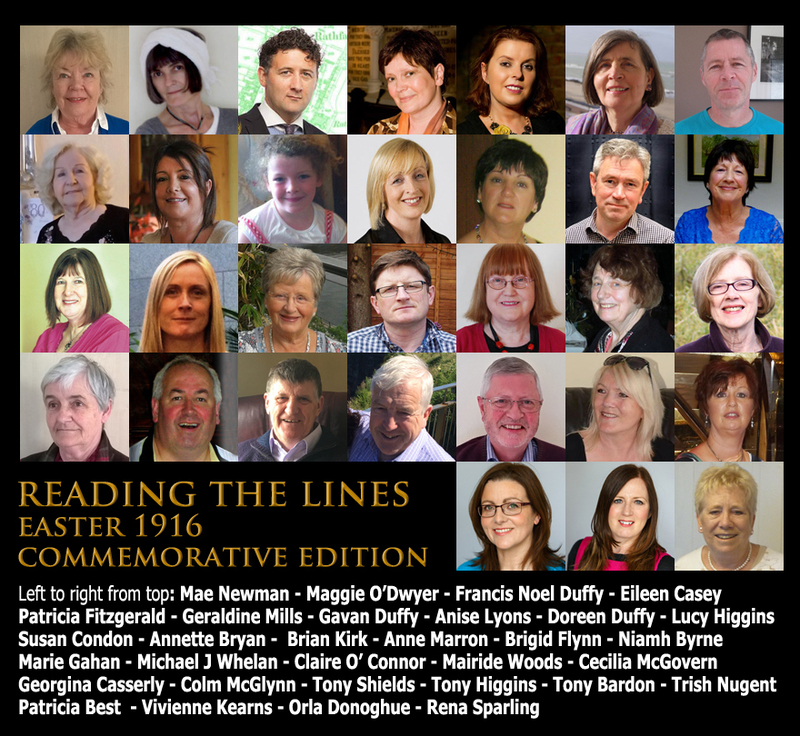 Among the audience were members of Platform One who read prose or poetry or sang, including Michael J Whelan, Eileen Casey, Tony Bardon, Marie Gahan, Áine Lyons, Doreen Duffy, Ann Marie Mullins, Patricia Best, Mae Newman and Susan Condon. As avid readers, I know this is a role we will all enjoy immensely.